The picture above has been extracted from a video showing a white police officer in North Charleston, South Carolina (patrolman Michael Slager) killing an unarmed black man (Walter Scott). As the video shows, Scott was attempting to run away from the officer in what seems to be a park of some kind. Scott has no weapon, and is clearly not threatening the life of the officer. The story was that Scott had been stopped because the car Scott was driving had a broken taillight. Broken taillight. Black driver. White policeman. Black man gets killed. This incident fits a common pattern of police killings. Such killings are historically unexceptional, occurring frequently, and they have heretofore generally been unpunished, and many of them have actually never even come to light. Such killings are now increasingly being brought to public attention by videos taken by bystanders. The horrible video of white police officers in New York City strangling Eric Garner to death, as he says, several times, "I can't breathe," exemplifies the exact same scenario: minor (possible) crime; black man involved; white police officer(s) involved; black man dies. Same pattern in the case of the killing of Michael Brown in Ferguson, Missouri. Same pattern in the case of Oscar Grant, in Oakland, California. The Walter Scott video is generally available online. This story from The Guardian has a version of the video, for those who want to watch it. The link above provides a copy of the Eric Garner video, for those who want to refresh their recollection of that police killing. That video, incidentally, is embedded in a story about how the person who took the video was put in jail. The person who took the video in the Walter Scott case has said that he almost erased it, because he feared for his life if he made it public. The story initially told by officer Slager was at total odds with what the video shows, and by releasing the video, the person who took it was proving that Slager lied about the killing. Unlike what happened in New York City in the Garner case, the white police officer here was not given an automatic "pass" on his killing of his black victim. Slager has been charged with murder, and he was promptly terminated by his employer, and is no longer a police officer in North Charleston. We will ultimately find out if the penalty handed down by the judicial system will be a condign punishment, or something more along the lines of a William Zanzinger type judgment. Here is another video related to the Walter Scott killing. This is the "dash cam" video from officer Slager's police car, showing the initial traffic stop. It became available to the public after the video showing Slager killing Scott in the park. I found it quite revealing. What the dash cam video shows is what many of us have experienced personally: a traffic stop by a uniformed officer based on a possible vehicle code violation. The officer comes to the driver's side window. He asks the driver for his license and registration, and then he returns to his police cruiser to get information on the driver and the vehicle by "calling in" the information the got from the driver. Nowadays, this is actually done, most likely, by accessing police databases from a computer in the patrol vehicle. The driver is supposed to stay in the car while these operations are being carried out, and any attempt by the driver to get out of the vehicle will result in an immediate command by the officer to get back in the car. Police officers (rightly) consider that traffic stops can be dangerous. They are "keyed up" as to possible dangers even in the case of the most routine stops. That is definitely evident here. From the dash cam video you don't get the sense that Slager started off with any ambition to kill the driver of the vehicle; yet, he ended up doing that. Why? Why? Well, the fact that Scott was black, not white, played a big role, but it seems pretty clear to me that Slager killed Scott because Scott ran away. Why did Scott run away? I don't think anyone exactly knows, at this point. Maybe the car was stolen. Maybe Scott was worried by the fact that he had evidence of some crime inside the car. Maybe Scott was (justifiably) nervous, since he is bound to have known that interactions between black men and white police officers often result in something bad happening to the black man. Whatever the reason, Scott ran. And here's what happened next: officer Slager ran after him. That's not shown in the dash cam video, but clearly Slager and Scott both ended up in the park-like area adjacent to the shopping center parking lot where the vehicle stop was made. 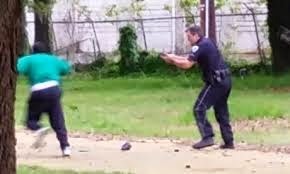 Probably, Slager actually caught up with Scott, and attempted to subdue him with a taser. Scott ran again, and he was executed by Slager by six or eight shots in his back. This incident, I think, should convey a lesson beyond the obvious one of the inherent racial bias that infects our society in general and law enforcement in particular. It demonstrates that police officers believe they are, or should be, the agents of "justice," and that they are personally responsible for and are supposed to ensure that justice is done. Running away from a law officer is a crime. It's called "resisting arrest." LOTS of such incidents result in physical injury to those who resist. Sometimes, as in this case, such incidents result in the death of the person whom a law officer has stopped. Here is my suggestion. Let's make clear to our law enforcement officers that we do not expect them to catch and control everyone who is (or who might be) violating the law. Let them go. If they aren't armed and immediately dangerous to the officer, or to themselves, or to the public, let them go. Law enforcement can catch up with them later. No need to run them down and stop their escape. The officer felt it was his job to keep Mr. Scott in custody. And Scott was running away. He was escaping. So, the officer chased him, and in the heat of the chase, he killed him. That was his methodology for making sure that Scott's escape was not successful. If it had been me in the car, since I'm white, I'm not at all sure whether I would have been killed, but if I ran, I believe I would have been chased down, and beaten up, and injured severely, because the police think it's their job to keep control of people suspected of a crime. Let's relieve police officers of that responsibility. If someone is stopped, and then runs, let them go. Catch them later. If the police did it that way, they would never make the mistake of killing someone as a way to ensure that they stayed put. The death penalty for a broken tail light is way too severe. So, let those violators go. Let somebody else catch them; or catch them later. Don't kill them. We should let our police officers know that we so not expect police officers to stop people from running away, unless those people are armed and dangerous, unless they pose a clear and immediate danger to the officer, or to themselves, or to others. Since I knew the end of the story, when I watched the dash cam video, my heart sank when I saw Walter Scott run from his car. Oh, no, I thought. Astute observations and a rational conclusion.